I had been injured for 106 days. It all started with falling in the Lookout Mountain 50. Continued with nagging swelling and Iliotibial Band Syndrome. Forced me to DNF the Uwharrie Mountain Run 40. And made me doubt whether or not I would make it to the starting point for the D-Day 100 Mile Honor Run in June. Then, three weeks ago after peaking my PT and employing a new Kinesio taping method, my pain disappeared into thin air. So, like any obsessive compulsive ultra-runner would do, I signed up for a marathon: the All-American Marathon in Fayetteville and Fort Bragg, North Carolina. Aptly enough, the home of the Airborne. On April 3, 2016, I stood on the start line of my comeback race with no expectations and a subtle bit of fear that the pain I had dealt with would come back to haunt me. The race started with the loud bang of two Howitzers firing simultaneously. Here we go. For the first five miles of the race, we weaved through historic downtown Fayetteville. Swinging by the beautiful Airborne and Special Operations Museum, I could not help but smile seeing the sun rise over the Iron Mike statue, standing ready over a heap of stone taken from Currahee Mountain. My pace was in the 8:40 range. This feels too easy. At mile six, the field departed the charming neighborhoods of downtown and swung onto the long and monotonous All American freeway that connects Fayetteville and Fort Bragg. It felt as though I had stepped into a wind tunnel. Gusts of 10-15 mph headwinds slowed my pace, and I felt myself fighting it with every stride. Less than ideal weather conditions, and the highway was a slow, uphill grind, too. My spirits were down, and I was getting into my head, which is never a good sign for me. As soon as I was beginning to get down on myself, we hit the “Blue Mile.” This one mile tribute, lined with the photographs of soldiers killed in action and American flags, always brings a tear to my eye. Even when my shoe came untied, I had little to complain about and took that moment to reflect, instead. Suddenly: Welcome to Fort Bragg. 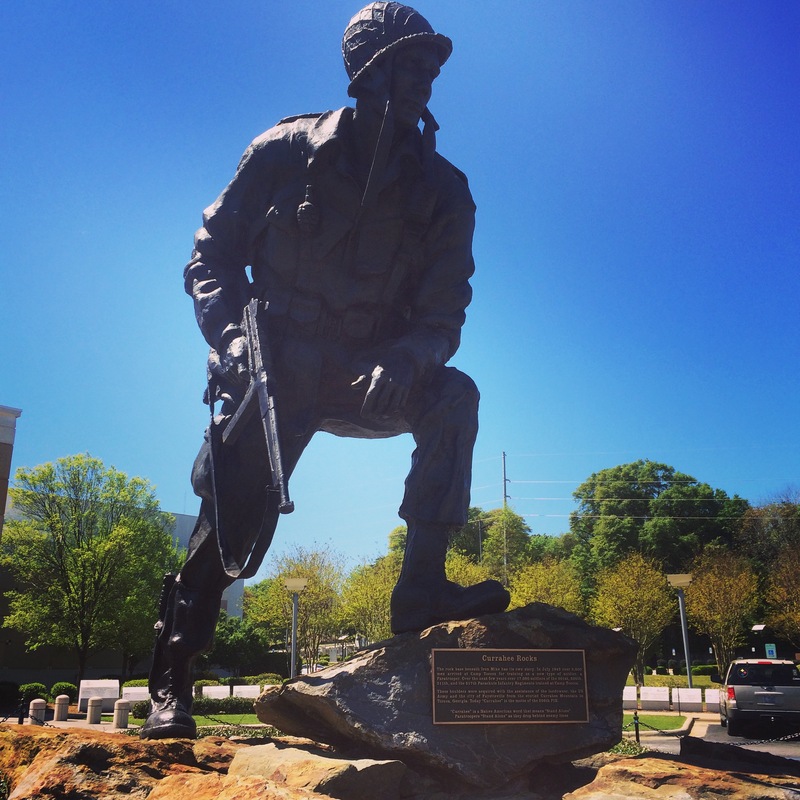 Home of the Airborne. Mile 10 drifted by in an instant and all runners exited the freeway, with half marathons splitting off to the right, and full marathoners continuing left onto Gruber Road, an equally monotonous stretch. I was forced to pause for an instant when a runner collapsed in front of me, but was able to continue shortly thereafter as a medic appeared on the scene. The strong winds continued and I continued to fight it. I felt as though I was expending a lot more energy than necessary because of this, particularly on the hilly backside of Fort Bragg. Mile 15 – 19 swung the field of runners around Pope Army Airfield, and then onto the hills around Longstreet, through the heart of the Army post. I was feeling the distance of this race, now. Do not stop. Then, a morale boost for me. A street sign that read: Ardennes Road. I miss that place; those hills and forests. Then Bastogne Drive. I could go for an Airborne beer right about now. Soon I was on Normandy Drive. I will finish this race and get back there. My pace quickened. A sudden, albeit false, familiarity arose inside me. Mile 25 and Iron Mike appeared out of nowhere. Time to kick it home. 6:38: the last mile of my comeback race, gone in an instant. I hit the finish line, celebrating as though I had won the race outright. 4:21 was not a PR for me. I have run much faster and much farther. But this race was about the comeback I never thought I would ever had. It was about overcoming my fears and my physical limitations. It was about celebrating the gift of running, and the fact that I am blessed with a body that can once again run 26.2 miles without suffering. This race was about punching a ticket to Normandy. Last time I cried was February 7, when extreme pain flooded my body and forced me to drop of my race. On April 3, I cried tears of joy, thankfulness for all those who believed in me, and in resolve. A soldier in ASU’s draped the medal I earned around my neck: jump wings. How apt. Thanks to the support of my sponsors throughout my injury and recovery, as well as those closest to me: I am so grateful. In the All American, I wore the Altra Running Torin 2.0, sported a Team Red, White and Blue race kit (for the first time! #EagleUp! ), fueled with Skratch Labs Exercise Hydration Mix Matcha + Lemons and Raspberry Fruit Drops Energy Chews. Girl…some of this even gave me goosebumps on my face! GOOD JOB! Haha. Thank you Lisa! Glad you enjoyed.